These instructions will help guide you through the installation of Nucleuz's DLP Policies in Microsoft Office 365 (O365) or Microsoft Exchange Online. If your DLP Package contains one or more DLP Sensitive Types Rule Pack files, install them first using these installation instructions. The DLP Sensitive Types Rule Packs must be installed before installing the DLP Policy. This is provided by Nucleuz. Contact Nucleuz if you do not have it. See Microsoft's Messaging Policy and Compliance Permissions TechNet article for more information about permissions for compliance management. Extract the contents of the DLP Package archive onto a computer with access to your O365 or On-prem Exchange Admin Center. 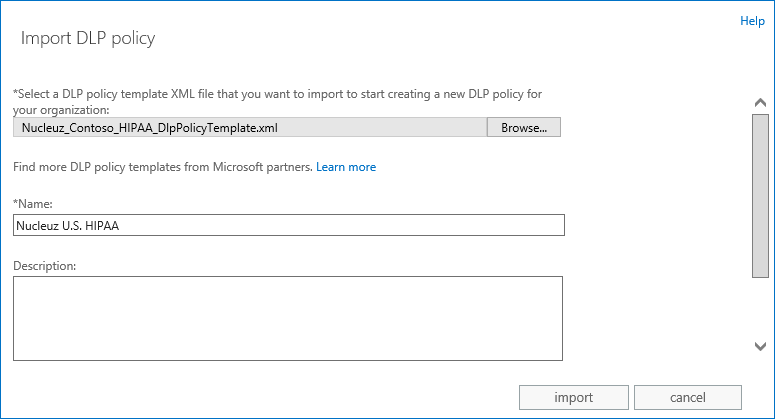 Locate the DLP Policy Template file. The DLP Policy filename typically starts with "Nucleuz" and ends with "DlpPolicyTemplate.xml". If your DLP Package archive contains one or more DLP Sensitive Types Rule Pack files, install them first using these installation instructions. 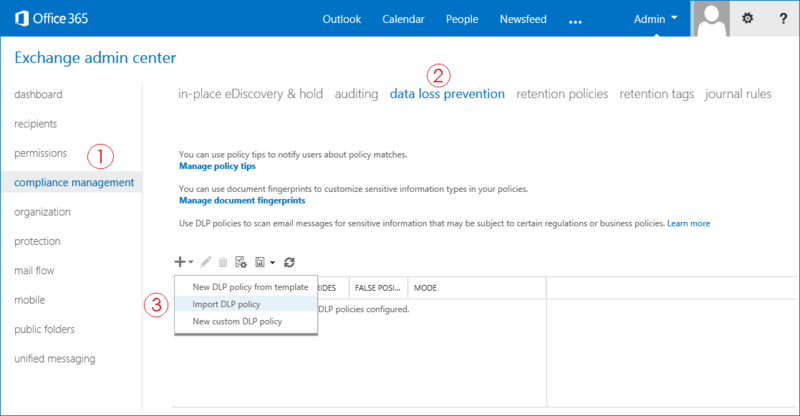 If your DLP Package archive contains multiple DLP Policy files, repeat the following steps for each such file. Sign into the Exchange Admin Center with a user who has the permissions specified in the Prerequisites above.